Every brand's Facebook reach took a huge hit the last time the social network adjusted its algorithm. Organic posts haven't achieved the same traction since, but there are ways you can strategically use promoted posts and ads to drive engagement. Mari Smith is a top social media strategist, and she is widely regarded as the top Facebook marketing expert in the world. She wrote The New Relationship Marketing and co-wrote Facebook Marketing: An Hour A Day with Chris Treadaway. Mari was recently named a top 10 Social Media Influencer, and she's a sought-after speaker on social media, relationship marketing, and technology; she has trained people in all types of business organizations to use social media to achieve success. I invited Mari to Marketing Smarts to discuss the precipitous drop brands have experienced in their organic Facebook reach, and what they can do to more effectively connect with their audience on the social network. If you're getting poor results with Facebook ads, study up (09:56): "Facebook ads work. It's the most targeted traffic your money can buy. Facebook ad failure is not Facebook error, it's user error. With all due respect, if you're not getting the results, you're not doing something right. Get help. Get training. Get education. You've got to understand how these ad products work, because you can reach the exact people that you want to reach." Increase Facebook engagement with email integration (13:43): "I always lead with organic. I'm always looking out for the small to medium-sized business owner like myself, and seeing how can we get that better organic reach. And there are many ways, including integrating, for example, with email. Once a week on Friday, I send out a newsletter called 'The Social Scoop,' and invariably I will direct my readers to a specific post that I've made on my page wall. Every single post on your wall has a unique URL, and it's the time stamp. You can drive people there through email." Think beyond 9 to 5, Monday through Friday (14:48) A lot of businesses, I think, are really missing out by avoiding evenings and weekends for their posts, even B2B, because people are on Facebook outside of work hours more for social reasons, so there's a golden opportunity to be seen in the News Feed if you're the only business in your industry that's active there on evenings and weekends." For more information, visit MariSmith.com, or follow Mari on Twitter: @MariSmith. Mari and I touched on many other ways to maximize your brand's Facebook reach, so be sure to listen to the entire show, which you can do above, or download the mp3 and listen at your convenience. Of course, you can also subscribe to the Marketing Smarts podcast in iTunes or via RSS and never miss an episode! This episode brought to you by the MarketingProfs Professional Development Program. 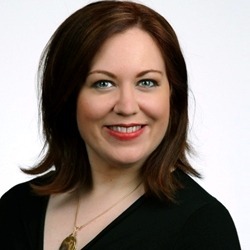 Mari Smith, Facebook marketing expert and author of The New Relationship Marketing and Facebook Marketing: An Hour a Day.